UPDATE: Reader OBH raises an excellent point; the increased spending on entitlements is even greater than depicted in the Times' first chart. Perhaps conservative blogging is passé. I've been complaining here for years about the budget being engulfed by over-stuffed entitlement programs, as opposed to (as lefties claim) defense spending. And I've been warning that we were headed for a test of the Meltzer-Richard hypothesis--the uncertain outcome when "the voter in the exact middle of the earnings spectrum receives more in benefits from [the government] than he pays in taxes." If I had to quibble, it would be that the first chart understates the government healthcare component of entitlement spending, because it appears to treat the Federal tax deduction on employer-sponsored health insurance as lower receipts, not outlays. This is despite the fact that the deduction effectively subsidizes a large share of health insurance premiums for employees (though not for the self-employed). Thus has our tax policy morphed into a foot-tall code of Byzantine false flags too complicated for any single Congressman or inside-the-Beltway lobbyist to comprehend. Scrap it and start over. [First,] inflation-adjusted spending for entitlement programs on all levels of government has soared from under about $1,000 per capita in 1960 to over $7,000 today. If you want to know why we have huge deficits look no further. . .
[Second,] the proportion of entitlement spending going to the poor has fallen from half to about a third. So increasingly we’re taxing the middle class to pay themselves their own money, minus a large commission to Washington DC. More stark is the inter-generational aspect--we’re taxing relatively poorer young workers to benefit relatively much richer elderly. Vindication -- my own points, now in the press -- should seem sweeter. But because liberals won't change their rhetoric or votes, I still feel cheated. 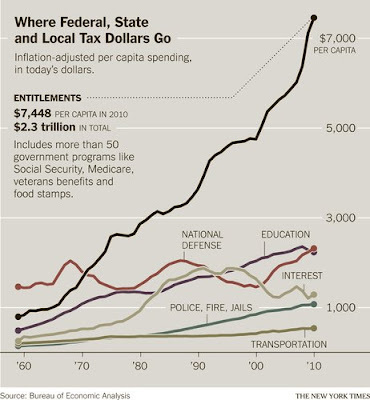 >>>> [First,] inflation-adjusted spending for entitlement programs on all levels of government has soared from under about $1,000 per capita in 1960 to over $7,000 today. If you want to know why we have huge deficits look no further. Indeed -- Moreover, that's per capita. It was never about the facts, though. It was about politics, and spending money for votes. So even if they admit the facts, the political equation has to change.